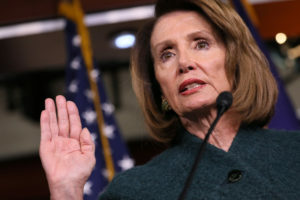 House Speaker Nancy Pelosi has asked President Donald Trump to postpone his State of the Union address to the nation — set for Jan. 29 — until the government reopens. The White House hasn’t immediately responded to a request for comment about Pelosi’s request, which she made in a letter to the president. The annual speech is perhaps the president’s biggest opportunity to present his agenda directly to the public. She’s also raising the possibility that Trump deliver the message in writing, as presidents once did.